The Fi-400Y and 600Y series of sealers allow film to pass through the sealing area, making it possible to seal other than the end on a bag. Fi-Y series can be used for processing block-bottom bags or sealing tube type films. 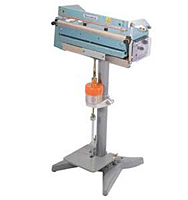 This remarkable sealers come standard equipped with the clamping retaining device, PK-102, to precisely even out the sealing finish and to effectively resolve the problem of user fatigue from operating the pedal by foot. Each unit features the timer to prevent overheating as a safety measure. Optional work tables are also available. Fuji offers a comprehensive lineup of models to accomodate a variety of bag sizes, thickness and materials. Available seal lengths are 400 and 600mm/ 15.6″ and 23.6″. Models for seal widths of 2, 5, and 10mm/ 0.07″, 0.19″, and 0.39″ are available. In addition to a single-side heating type capable of sealing materials up to 0.3mm/ 11.8mil thick, there is a double-side heating type capable of sealing thick or laminated pouches up to 0.4mm/ 15.7mil thick in total thicknes of overlapping sheets. The double heating type is good also for gusset pouches. There are also three types of cutting mechanism that you can choose from. Types 5C and 10C use a cutting heater to cut through the centerline of the sealed area. It can be used to seal and cut apart the tube-shaped film at the same time to make bags. Type YC is equipped with a cutting mechanism to cut excess bag (film) ends. Slide the cutter knob sideways in either direction to cut the tube-shaped film after sealing it. The melt-cut type can be used for processing bags in which a round-wire melt-cutting heater is used to cut the bag/film. The Film can pass through the sealing area. Strong, beautiful seals with effortless foot operation. Numerous model variations to suit all types of applications. Standard equipped with mini solenoid PK-102 to make the foot operation even easier. Daily use frequency as model selsctionguideline: Up to 1,000 – 3,000 bags, foot-operated.